Information about Excessive Computing, specials, and any events. Hello everyone. My name is Travis, the owner of Excessive Computing. I thought some of you might like to be interested in learning about our office, or what I like to refer to as my command center. We’re located in Alpharetta, GA. You can see some pictures of the inside of our office. The desk with 5 monitors is mine (click the image to see all of them), and I like to refer to it as my command center. 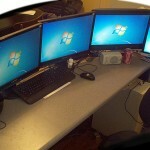 You see a total of Four 22″ monitors and One 19″ monitor. I only purchased new the Chimei and one Samsung. The rest I received broken and repaired them. In fact, out of all the screens you see in the office pictures, all but the two I just mentioned were broken and I repaired. Under the command center desk is my office computer and the office Linux server, both quad core AMD systems. In another picture you see the long black executive desk. More monitors and 3 computers underneath. One is our BSD based network router, one is a VOIP server, and one is a Linux office PC. Soon to be added is a Windows Server. The final two pictures are two small desks where we work on PCs, monitors, etc. If you’re interested in a setup like my command center or anything else I’ve mentioned, or just need some support, we will be happy to help, so give us a call today! So Many Technical Services Alpharetta GA – How Are We Qualified In All Of Them? COMPUTER REPAIR ALPHARETTA GA – DOES YOUR SERVICE COMPANY PROVIDE A WARRANTY?